THE University of Huddersfield's Professor Xiangqian Jiang – known to her colleagues as Jane – has received the Damehood conferred on her in the 2017 Queen's Birthday Honours. The Chinese-born scientist, a world-leading researcher in the field of metrology, was formally created a Dame Commander of the Order of the British Empire at a ceremony at Buckingham Palace. The honour was conferred for Dame Jane's services to engineering and manufacture. It is the latest stage in a journey that has taken her from self-education in Chairman Mao Tse-Tung's China, where she was compelled to work on a production line, to academic eminence in her adopted UK. 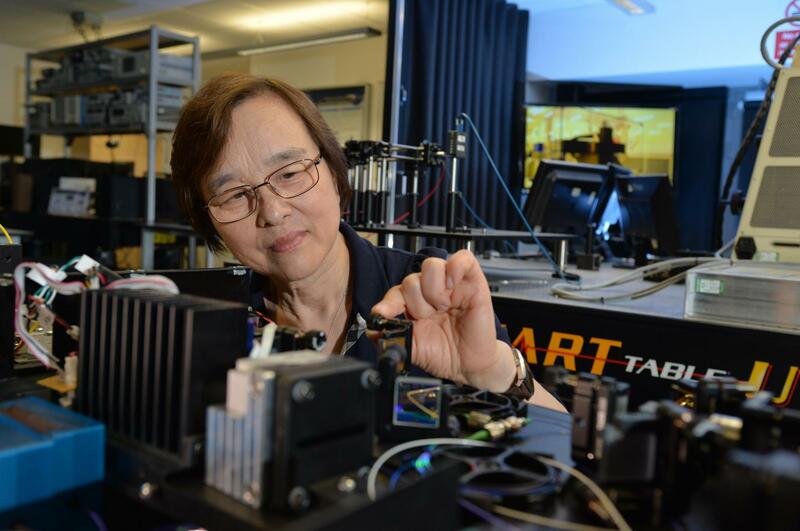 Dame Jane's roles at the University of Huddersfield have included research director of its Centre for Precision Technologies (CPT) and Director of its EPSRC Centre of Innovative Manufacturing in Advanced Metrology. She is now the director of the £40 million Future Metrology Hub that is based within the CPT. Its mission is to develop new technologies and universal methods that will integrate measurement science with design and production processes, to aid the development of digital, high-value manufacturing. Dame Jane was made a Fellow of the Royal Academy of Engineering in 2012 and a prestigious Royal Academy of Engineering Professorship was conferred in 2016. She has published more than 330 papers, is the author or co-author of eight books and holds several patents in the field of measurement science and surface metrology. Her parents were doctors in Shanghai, but lost their homes and careers during China's Cultural Revolution in the late 1960s. At the age of 15, Jane was put to work on a production line in a factory making buses and remained there for almost 20 years. Her natural scientific ability meant that she moved from the production line into the metrology laboratory and spent her evenings teaching herself engineering and mathematics. For two decades the authorities turned down her request to go to university, but in 1990 her results were so good on the National Graduate Admission Examination she was allowed to enrol directly for a Master's at Huazhong University of Science and Technology. This led to a PhD and in 1999 she won an award for China's Best Engineering Dissertation of the Decade. At the age of 38 she came to Britain, working as a research engineer at Birmingham University, before relocating in 1998 to the University of Huddersfield, which became home to the Centre for Precision Technologies. In 2003, she was appointed a professor. In 2006, Dame Jane received the Royal Society Wolfson Research Merit Award, plus the Lloyds TSB Asian Woman of Achievement Award and was presented to The Queen as one of the people that had made a significant contribution to national life in that year. In 2007, she was ranked as the fifth most influential women of Chinese origin in the world and in 2014, she received the Sir Harold Hartley Medal from the Institute of Measurement and Control, and also the Institution of Engineering and Technology Innovation Award for leading work on manufacturing technology.